If media speculation is to be believed, Reese Witherspoon is “in talks” to reprise her role as Elle Woods in Legally Blonde 3. The US actress is teaming up with the film’s original writers and producers to work on the third instalment, according to The Hollywood Reporter. A cult classic amongst law students, Legally Blonde first hit cinema screens in 2001 and followed the exploits of scatterbrain law hopeful Woods at Harvard Law School. 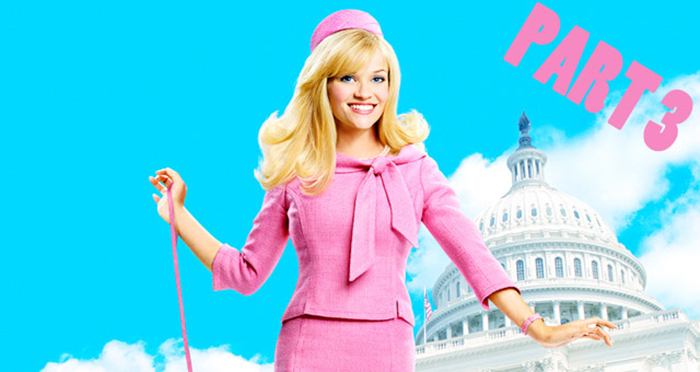 The 2003 sequel, Legally Blonde 2: Red, White & Blonde, sees Woods travel to Washington DC on her mission to ban animal testing. Since then, fans have been eagerly awaiting their next Woods fix. While there are no details yet on the plot, website Deadline is speculating that it will be about “female empowerment”. This isn’t the first time that rumours of a third movie have done the rounds. In 2017, US president Donald Trump appeared to pay his own tribute to Woods during a speech to graduates at Liberty University in Lynchburg, Virginia. The internet went into overdrive after The Tonight Show pointed out the striking similarities between Trump’s address and one given by the fictional lawyer. ‘Legal Cheek Reporter’… I smell the acrid odour of Katie King and her inferior journalism! Legally Blonde brought the legal profession into disrepute. “While there are no details yet on the plot, website Deadline is speculating that it will be about “female empowerment”” – Nah, you’re alright. Yummy yummy I love to eat it. Its so cheap and bits get saved on my beard for sneaky treats later in the day. Still enjoying your stolen name I see. Sissy. Eat the pie you cuck.